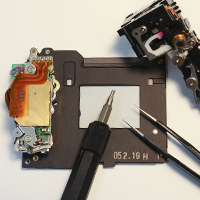 Not only does Spencer's Camera & Photo provide IR Conversions and Astrophotography Conversions, we also provide experienced repair services for all digital and film camera makes and models, lenses, lighting equipment and video camera/camcorder equipment. We don't work off of "Flate Rates" or "Minimums" which only benefit the repair shop. We provide free estimates for every repair and will await your approval before any work is performed. Simply fill out and submit the "Repair Quote/Information Request" form below and we will provide a free repair estimate as soon as possible. Please be as complete as possible in your description of your equipment make, model and issue you are having. This will enable us to quickly provide the repair estimate without the need of additional information. Also, please feel free to contact us via email at: repairs@spencerscamera.com or by phone at (801)367-7569 for any questions you may have or if we can help with any camera needs.